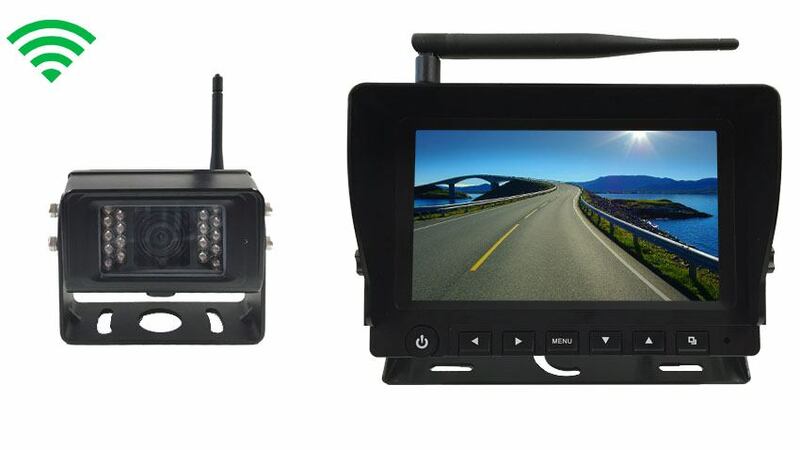 This Enhanced wireless backup camera with 7-inch Digital LCD Monitor is a perfect addition to any RV, Trailer, Van or Motor coach that needs assistance backing up or viewing the road behind them while driving. This monitor has a built in speaker so that you can hear the person behind you. This helps when parking especially in tight spots, such as what you would see in the large trailer and RV parks. This monitor will allow you to connect a second digital camera or upgrade this system to a split screen and add up to 4 cameras, each digital and can go up to 120ft. When purchasing this system, we include a dash mount, 12 volt pig tails, and a commercial grade cigarette adapter. When we designed this RV backup camera we focused on the user experience and made sure that when you use it, you would focus on the road and not fumble with buttons. This Digital Wireless RV Box camera is the best backup camera we ever built. This back up camera has a 130 Degree viewable angle and its waterproof, enhanced night vision. The camera is one of the most durable we have, with incredible adjustability and night vision clarity. The RV Box camera has a heavy duty sun shield visor to protect you from glare and pebbles. This is by far our toughest built camera to date. It has been regularly used in RV's, van's, buses and even industrial sized caterpillar trucks, operated in the harsh oil sands of Canada. This camera can take a direct hit from a rock and it will still work like new. It has also been very popular with RVs because it's housing allows you to install the cameras on multiple sides of your RV. The 130 degree CCD lens is the clearest and highest quality camera TadiBrothers sells. If you are looking for a wireless backup camera that is built to last with no interference, this is the RV backup system for you. This RV backup camera also has its digital transmitter's built into the camera so there is no need to run any cables through your Car or RV, other than 12 volts (even then we have 18 hour rechargeable battery packs). This digital wireless system technology is exclusive to TadiBrothers and although we advertise it goes to 150ft we have tested it up to 200ft with no interference. With the wireless cameras BUILT IN transmitters, simply connect the camera directly to 12 volt source or use our 18 hour battery pack and you were done no transmitters to fumble around with. Simply connect the camera to the 12 volts and the monitor to the 12 volts and you are done. "I purchased this for our 2014 Itasca Impulse Silver 26QP, a 30' Class C, to supplement its bumper view camera. I wanted a full-time rear-view camera instead of the useless window rear-view mirror and didn't want the hassle of installing a lot of wiring. Yes, this one easily cost 2x what other systems cost, but I only wanted to install and set-up once and wanted the best quality. PROS: Quick delivery. Once installed and set-up, it works exactly as specified. I'm very pleased, as I get a nice clear picture of everything going on behind me day or night. It also makes it easier (and safer) when backing up into tight spots. CONS: No installation instructions to speak of; you're on your own to figure it out, though it's not difficult. I'd love it if there were instructions to show how to connect the monitor into the light switch for "on with lights" full-time use (couldn't find a YouTube video to help either). You'd think this would be easy, considering that most C's and A's are built on Ford E or F chassis. The big camera antenna prevents the camera from being rotated up so that you can see the horizon of the road. You have to add a spacer between the RV and camera mount to have more space to rotate the camera up. No window or roof mount for the monitor is included, just the "bolt onto the dash mount." To fix this, I recommend the RVS-619UM windshield mounting arm from Rear View Safety. It replaces the stock mirror mount with one that will support the TADI monitor. Also, the monitor has a big antenna that somewhat limits adjustments for viewing angle. Finally, the audio is pretty useless: at full volume, you only get garbles from the person at the rear trying to guide you back, and you really want it OFF when going down the road. To sum up: It's a good system once installed, though pricey, but that install comes with some challenges." "I installed my camera on my 5th wheel trailer last week and took my trailer on a campout over the Memorial weekend. The installation was easy and took about 1 1/2 hours. Overall I am very happy with the only downside being when using the system to monitor road traffic while driving. Occasionally the monitor reads No Signal. This drop out last from a second up to 10 seconds. Irritating but not dangerous. My biggest irritation is the non intuitive nature of the monitor software. Tech support walked me through the screens and I was on my way. " " Words cannot describe the joy I feel every time I look at my monitor, the daytime image is absolutely amazing and the nighttime image is even better. I suggest that if anybody wants to buy a backup system by this monitor it is no contest and it is clearly the best out there. It is a little more expensive but I am very happy with the product so I guess it was OK that I paid a little more. " " Over the last six months I've tried three wireless systems each one of them disappointed me. However, I purchased the tadi brother system about three weeks ago and it has worked flawlessly ever since I've never seen any static in the nighttime and daytime images are perfect I use this in my tractor. So this means that I go through a lot of debris in dust but the cameras look like they were new and they were perfectly every single time. I guess it was worth spending the extra few bucks for the digital maybe I will get it for the rest of my fleet "